Mikhail Gorbachev, CC CPSU General Secretary, with his wife, Raisa, near an orchid tree that he planted in New Delhi. 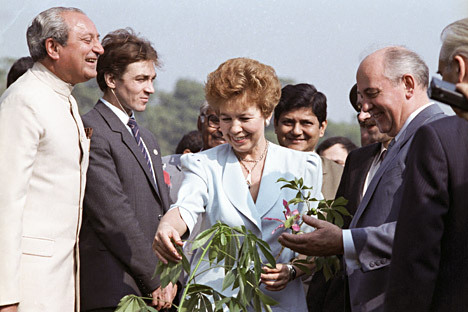 The former first lady of the Soviet Union, Raisa Gorbachev, played a stellar role in helping the growth of bilateral ties in the mid-1980s when her husband Mikhail Gorbachev was President. Raisa Gorbachev, the only First Lady known to the world during the Soviet era, was also the first Russian woman who changed not only the attitude of the Western nations toward the wives of erstwhile Soviet leaders, but also played a key role in promoting the India-Russia friendship. She was actively involved in promoting ties during the years her husband Mikhail Gorbachev was in power as the Soviet Union’s President, in the mid-1980’s. Raisa first appeared on the world stage with Gorbachev in 1984, during his visit to Britain, where she was hailed as a “Soviet version” of the Princess of Wales. Raisa’s style, in fashionable clothes, with her high-profile visibility, made the First Soviet Lady the antithesis of everything traditionally associated with the wives of Soviet leaders. She broke away from the traditional image of the wife of a Soviet leader to never look back. By the time she came to India with Gorbachev on his first official visit, at the invitation of the late Prime Minister Rajiv Gandhi, in November 1986, the Soviet First Lady had visited Paris, Geneva and Reykjavik, and become quite an international icon. However, Raisa’s trip to India in November 1986 had a special meaning for her as far as the India-Russia friendship was concerned. The Indian press called Gorbachev’s visit as the beginning of “second honeymoon” between the two countries. As India and Russia embarked on the path of a new era of bilateral friendship, the visit was also important for Raisa, for some reasons. It was during her four day visit to New Delhi that she pledged to dedicate herself to the cause of promoting the traditional friendship between the peoples of India and Russia. She found Sonia Gandhi, her Indian counterpart, equally enthusiastic about cooperation in her mission to boost Indo-Russian ties. Their warm personal friendship, formed during Rajiv Gandhi’s first official visit to Moscow in May 1985 helped her build a solid platform to work together to raise the level of all-embracing people-to-people contacts between the two countries. As a journalist covering Gorbachev’s visits, I still vividly remember how Raisa breezed through the National museums and other historic and cultural sites in New Delhi to personally see and know things from the scholars and experts with her deep curiosity about Indian tradition, customs, history and culture. She was, for example, keenly interested to know that why the Ganges River is believed to be so sacred, and why Hindu gods have so many heads and hands. She also wanted to know about the life of Buddha and Buddhism and Yoga in India. The searching questions she asked reflected a sincere desire within her to acquire knowledge in different fields of Indian life and apply it in future for the development of people-to-people contacts between India and Russia. They also revealed her belief that along with high level official interaction between Moscow and New Delhi, people-to-people contacts were very important, as they help develop relations between civil societies of the two countries. She harboured sincere feelings of love and friendship towards the people of India and conveyed the same warmth wherever she visited. For example, at the Indian Handicraft Emporium she purchased a Benares silk sari for her daughter Irina to dress her “like an Indian girl.” When asked, she told a journalist that she had not bought anything for herself and her husband. “Our trip to India is the best souvenir,” she said, conveying a message of friendship and goodwill towards the people of India. During her visit, Raisa also embraced her role as Russia’s cultural intermediary with increasing enthusiasm and love for Indian culture, art, music, dance and drama, which was revealed in a meeting with a group of leading women intellectuals. If Raisa was curious about India, the people of India were no less curious about her. She pulled large crowds outside each place she visited, greeting people with a folded hands “Namaste,” the traditional Indian style of greeting people, for which she had developed a special liking. Raisa’s warm personal rapport with Sonia Gandhi got a further during Gorbachev’s visit to New Delhi in November 1988 for the closing ceremony of the year-long Indo-Soviet Cultural Festival. In a way, Raisa and Sonia were the main motivators for holding the simultaneous year-long Indo-Soviet Cultural Festival in India and Russia in 1987-88. Sonia Gandhi escorted Raisa Gorbachev everywhere she visited. Raisa’s interaction with the various segments of Indian intelligentsia and civil society in New Delhi unmistakably demonstrated her deep knowledge and understanding of India, necessary for the ambitious task of strengthening India-Russia ties. With each official trip to India, Raisa seemed to grow, becoming more accustomed to her role of a key player in pushing India-Russia relations. Each time she visited India, she was welcomed as a champion of friendship between peoples of the two countries. She was absolutely convinced that without greater emphasis on cultural and peoples’ exchanges between Russia and India, it was difficult to rapidly develop bilateral ties in different fields, in the interest of the two countries, in the 21st century.